The transformation from Ed Nygma into the villainous Riddler has not hit its final phase on Gotham, although it is getting close. Audiences have seen him in some subtly green clothing -- he has definitely made use of some question-marked clues -- the full, often flamboyant persona has yet to emerge. However, Nygma beginning to embrace the sadistic ways has emerged, and it was quite sudden. With the accidental strangling of the one woman that may have been able to pull him out of the darkness, his descent became inevitable. 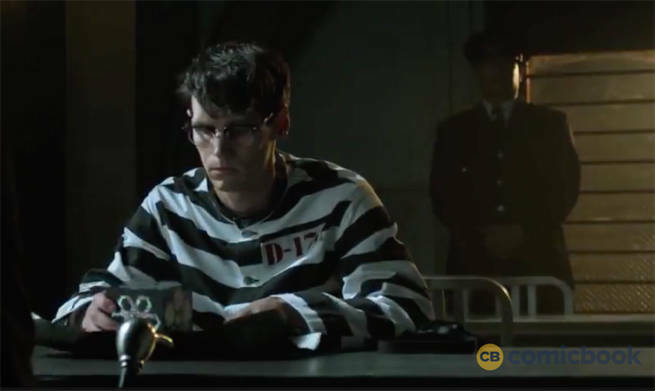 Cory Michael Smith told ComicBook.com that his character doesn't blame himself, or the Gotham PD coworkers who endlessly teased him, for his turn. Instead, Nygma knows exactly who has wronged him. "Fate," Smith said. "He accidentally killed two people, when he had good intentions. So I just kind of like this idea that Ed very physically manifested this part of himself that he thought was outside of himself, this ability to do these horrible things." Smith has been exploring the evolving Nygma over the course of two seasons. He said that while that darkness was inside him, embracing it was inevitable - and also something Nygma never thinks is his own fault. "He thought he was innocent of all those feelings because he’d denied them for so long," Smith said. "Then learning to embrace them, that they are part of him, and I think his – the way that he normalizes things or psychoanalyzes things is different than most people. "So seeing this reality given to him by fate, he thinks that all these bad feelings mean that he’s a bad person; it’s part of his capacity to do this, so he’s going to because fate has decided this is his life. That’s versus other people who might be like, ‘Oh, I made a mistake. I get angry sometimes, but that doesn’t mean I’m a bad person.’ He’s so consumed by this." Smith added that Nygma is not someone who intended to be a horrible person, and even found some normalization and comfort in his time with Kristen Kringle. It was a dream come true for the awkward medical examiner, according to the actor. He added that Nygma had the idea of a normal life that other people experience, and he ruined it, accidentally. To open the third season fans will first see Ed Nygma right where he ended season two -- despite the several months time jump - locked up in Arkham Asylum. The experience is something that Smith said has been pretty brutal on the villain who relies almost solely on his way of being able to think his way out of problems. "At the top of the season, we have someone who is just rotting away in this place, and is really tired," Smith said. "The reality of Ed’s existence is that it’s pretty uneventful in Arkham. Which is dulling to his brain. "I have to get the hell out of there." How he gets out is in question, but Smith promises that Nygma won't be stuck in there for too long. Gotham Season 3 kicks off September 19, 2016 at 8pm on FOX.